I've always been more than partial to a bit of that roguish antiques dealer Lovejoy and his charming antics in the more picturesque corners of East Anglia. 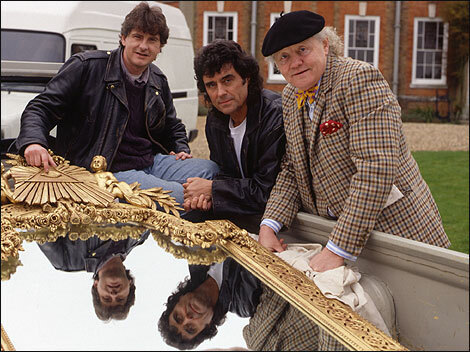 It's an obsession which first manifested itself in the early 90s when Sunday evenings simply weren't complete without a helping of Lovejoy, Tinker Dill and Eric Catchpole. However, my passion for that leather jacketed rascal didn't end with the end of the series. Several years later I found myself unemployed and with very little to do, but, thankfully, BBC1 was showing mid-afternoon repeats of Lovejoy, so, with a bottle of ale purchased with my precious dole money, I used to while away the long, lonely afternoons dreaming of being an antiques dealer with edge. Fast forward a few more years and I was unemployed again (believe me, I do work occasionally), but this time had a rather hearty redundancy payout. Again, I retreated to the sanctity of watching Lovejoy, but now I had the opportunity to take my interest a little further. 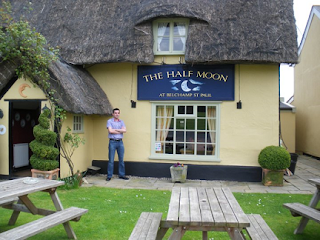 And that's why I filled the car up with petrol and headed down to The Half Moon Pub, Belchamp St Paul which was an actual Lovejoy filming location; whilst there I glugged down a pint of ale and truly felt at one with my Lovejoyness. Crazy days. Anyway, I'm digressing a bit and revealing far too much about the minutiae of my retro TV obsessions, so, instead, let's take a look at the show itself. And one thing that it managed to pride itself on - thanks to Ian McShane's contacts and the show's prestige with the viewing public - was it's array of guest stars, so let's take a look at 5 of the best. 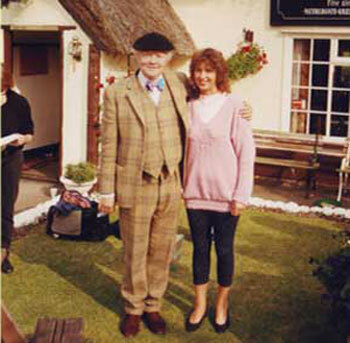 Appearing in the first three episodes of series three, Victoria Cavero glided into Lovejoy's life as one of Lady Jane Felsham's friends and, for a brief moment, made him the happiest man in East Anglia. After dealing with a troublesome South American ring of Victoria's, Lovejoy sweeps her off on a romantic sailing weekend where Victoria manages to tease out Lovejoy's elusive christian name - it's Horatio, but, of course, he's joking. Sadly, Victoria turns down Lovejoy's marriage proposal before leaving for South America, but you get the impression that she was Lovejoy's one true love, easily trumping Lady Jane and Charlotte Cavendish in romantic value down at the sales rooms. And this is in no small part to Lumley's elegant charisma which appears to have been rampantly charming all and sundry for decades. Although his screen time is fairly limited in series six's 'Double Edged Sword' it's always a delight to see Julian Glover lighting up the screen and Frank Whymark continues his fine acting legacy. Shot through with a dose of Cockney villainy, Frank Whymark is a man whose tempestuous patience is being tested following the theft of his 18th Century samurai sword. Not wanting to get the police involved, Frank enlists the services of Lovejoy to bring back the sword. And even gives Lovejoy the nod to use bullets if necessary. It's a quintessentially menacing performance by Glover, but he also manages to tap into a vein of humanity when parental strife comes trotting into town in the form of his rebellious daughter Joanna (Julia Sawalha). 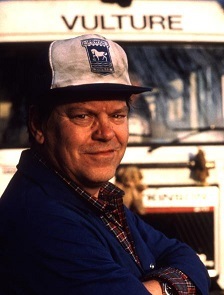 Warren Clarke provided an interesting insight into the complexities of a humble refuse collection man in the series two episode 'Bin Diving' as Brian Nun. Despite being firm mates with Lovejoy, Brian is much more than just a roguish ne'er do well and has a cultured palate which delights visitors to his kitchen. Naturally, any friend of Lovejoy will always be a little rough round the edges and Brian Nun certainly takes great exception to Eric's 'bin diving' enterprise to turn up discarded treasures. As a custodian of the nation's rubbish, Brian believes he has first dibs on anything being chucked out. Something Eric discovers the hard way. It's a tough character to pull off, but Warren Clarke always had that peculiar brand of gruff charisma which allowed him to transcend cliched, burly louts and inject a captivating sense of intelligence to bubble away beneath his hangdog expression. A special mix indeed and one which could have easily allowed Brian Nun to make repeat appearances. With a manic twinkle in his wide eyes almost as wild as his eyebrows, Ken Campbell never failed to make an impact when he bounded on to the nation's screens and in the series 4 episode 'Lovejoy Loses It' he summoned up all his comedic physicality to fantastic effect. Paired with an outrageously sinister set of buck teeth which underline his crooked nature, Ted Goat is an unscrupulous gent who eagerly scans the obituary columns to get his grubby incisors into grieving relatives who don't know what to do with the deceased's antiques. However, it's when he's trying to make a few quid out of a Georgian wine cooler at the expense of Lovejoy and Charlie Gimbert that his slimy, duplicitous nature comes to the fore. 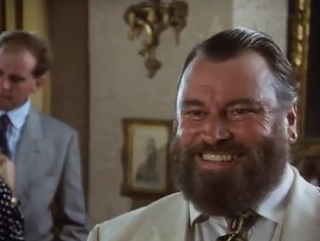 A despicable character, then, but one who's packed with enough immense fun to spend your Sunday evenings cringing to. Charm personified - on the surface at least - Harry Catapodis makes his presence felt in the last two episodes of series 2 to cause mutterings of consternation amongst Lovejoy and his peers. Happy to wax lyrical about Lovejoy and describe him as "One of the best antique dealers in the whole of Europe", Catapodis also does a nice line in deception. This deception comes in the form of flogging forgeries such as Emperor Hirohito's ceremonial tea bowl, so, with these fakes netting humungous profits for Catapodis, Lovejoy decides that it's time to stitch Catapodis up like an antique kipper. Blessed brings Catapodis to life with his usual boisterousness, but there's a refined brilliance to his performance here which helps to personify the dubious machinations of his mind. And, yes, his booming voice is in full throe, so there's a delightful glimpse of one of the inimitable wonders of British TV. 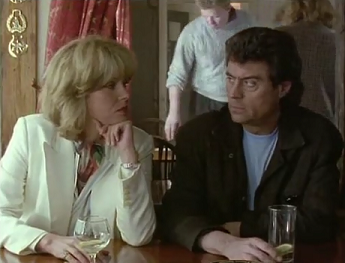 So, who were your favourite Lovejoy guest stars? Oh and, as an added bonus, here's me poncing around outside The Halfmoon Pub in the desperate hope that Tinker Dill will come stumbling out and recruit me on a mission to retrieve an Edwardian goblet. Or something. I hear you mate. Sundays were all about Lovejoy in the 90s, a chance to briefly forget the fact that school was waiting for you the following morning! I loved the show, but in my early 20s I really got into the books which are a world away from the cosy, genteel charms of the series. Only the first season comes close to capturing some of the hard, violent edge of the novels. As for a favourite guest star, I always rather liked it when Dinsdale Landen popped up as Lovejoy's mentor, and Lionel Jeffries delighted as a porcelain expert. Loved Warren Clarke as the bin diver. 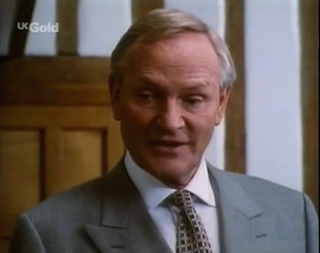 Dinsdale Landen was in the running for this blog, but Julian Glover just edged him out! Bravo, but I must protest: it is Charlie Gimbert, not Gilbert. Gimbert - like Lovejoy - is a regional name and is currently gracing buses in Suffolk. Perhaps the most famous Gimbert was train driver Benjamin Gimbert who was awarded the George Cross when he moved a burning train full of explosives away from the town of Soham, thus saving the inhabitants from being blown to bits. He is in Wiki. Alas, we lost actor Malcolm Tierney who played Gimbert, in 2014. Many thanks for casting your forensic eye over my blog and, yes, I've corrected that glaring error now! Funnily enough, I only saw that blog a few weeks ago. Some very interesting insights there from old Eric. Never realised his character was supposed to be so young! 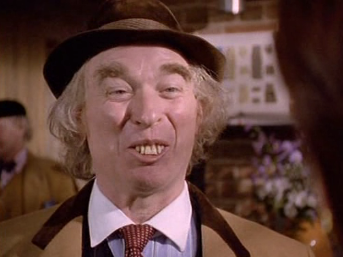 I'm currently reading Ken Campbell's biography and there's a comment form his agent who said that he was something of a nightmare to represent because he wasn't really interested in working for the money, what would happen is he would get obsessed with a TV show like Lovejoy and badger away until he got a part on it! Campbell was certainly in it for the art rather than the money. He was always trying to push the boundaries in his early days from what I've read. Does it mention Erasmus Microman in the book? I'd love to watch it, but not been able to find any of it anywhere. Lovejoy became somewhat of an obsession with me (notably series 1),even recording the soundtrack to play in my car ,the audio images flooding back as a consequence of repeated viewings. Still today,incredulously 32 years since it was first aired,if I'm close I occasionally head up to the locations ,Lavenham,Coggershall,Kersey,Walberswick,Pin Mill and so on. It is kind of reassuring I am not the only one ! I caught the series 1 repeat in about 1990 and everything thereafter. I'm just watching the DVDs agin at the moment. Watched the end of series 4 and 5.1 last night. I have to say, I HATED and still HATE Joanna Lumley in this!